Quote: President Donald Trump urged Arab and Islamic leaders on Sunday to unite and do their share to defeat Islamist extremists, making an impassioned plea to "drive out" terrorists while toning down his own harsh rhetoric about Muslims. Trump singled out Iran as a key source of funding and support for militant groups. His words aligned with the views of his Saudi Arabian hosts and sent a tough message to Tehran the day after Hassan Rouhani won a second term as Iran's president. The U.S. president did not use his signature term "radical Islamic terrorism" in the speech, a signal that he heeded advice to employ a more moderate tone in the region after using the phrase repeatedly as a presidential candidate. "Terrorism has spread all across the world. But the path to peace begins right here, on this ancient soil, in this sacred land," Trump told leaders from about 50 Muslim-majority countries representing more than a billion people. "A better future is only possible if your nations drive out the terrorists and drive out the extremists. Drive them out! Drive them out of your places of worship, drive them out of your communities, drive them out of your holy land and drive them out of this earth." There is such a difference from him and Obama. is it hard for them to get along with each other ? for 62 years ,, I've heard the terms : Middle East Crisis "
but shee shits man ,,, for 62 years ? Do a little study of WHO the House of Saud is..... hint: related to the Donmeh in Turkey..... THEN you will know why the crisis never goes away. Isis is the Intelligence services of the U.S. Britain, and Israel working together to build a bogey man. Why else would the U.S. bomb those fighting ISIS during battles and dropping supplies to ISIS during battles???? Why did ISIS recently APOLOGIZE to Israel? Trump needs to do the same study. WE are the reason for upheaval in the MIddle East. Gotta' admit ~ he scrounged up a bunch of adjectives for Islam in that speech. 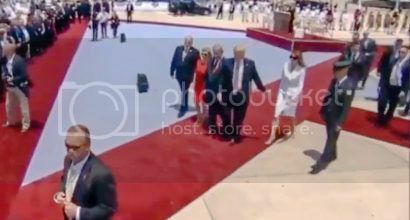 President Trump just landed in Israel, any one notice the pyramid at the end of the Red Carpet ? Edit: The pyramid is also Unity. Do you have a pic of that? A link? Yesteryear was not too soon. But then again - it looks more like a political supremacist organization than a religion. and the Soviet town block Bolshevik Komissaar, 1935. (05-22-2017, 03:12 PM)Meh Wrote: Do you have a pic of that? A link? Best I can do, but I'm sure there will be more on this, time will tell. I will do some more research and see if I can find it, everything I am looking at it gets cut. Using Firefox are we ? I get that same pop up every time I open Firefox . what's going on with the Don Doo today ? Has He agreed to Bomb anything good today ? Completely lost, what the hey you talking about young man ?